Group accommodation 30 people - 15 bedrooms. 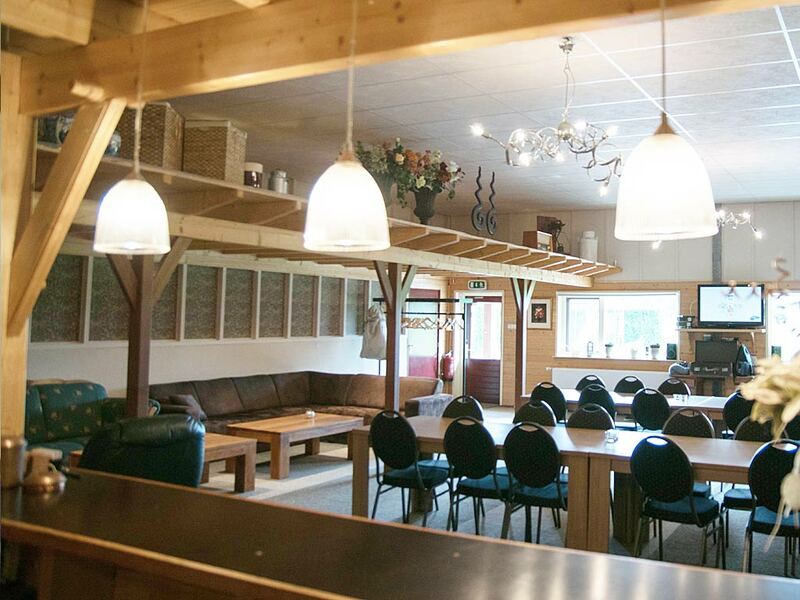 Group accommodation Kom in de Bedstee is equipped with 15 cupboardbeds for 30 people. 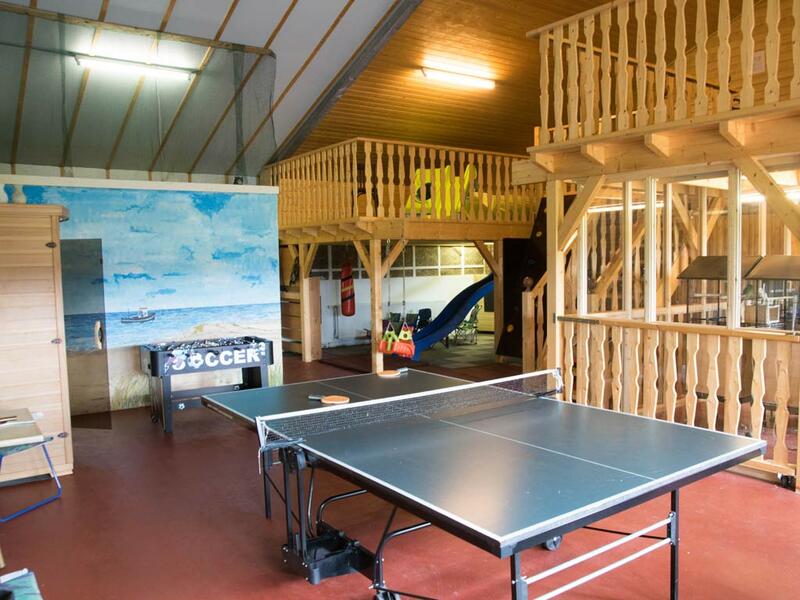 The group accommodation is fully equipped and pleasant for kids, adults, and accessible for the disabled. The separate, fully heated indoor playground is a true paradise for the kids. The playground is equipped with a slide, climbing rack, pool table, foosball, table tennis and mini-cinema. The indoor playground is the perfect way to rest as a parent. Outside, on the big lawn, is a volleyball field, swing and multiple playsets placed. For the real fan there is a wood fired hot tub that can be used throughout the whole year. You can take a seat on the terrace while keeping an eye on your kids who are having a great time on the playground. Next to the living area is our kitchen. 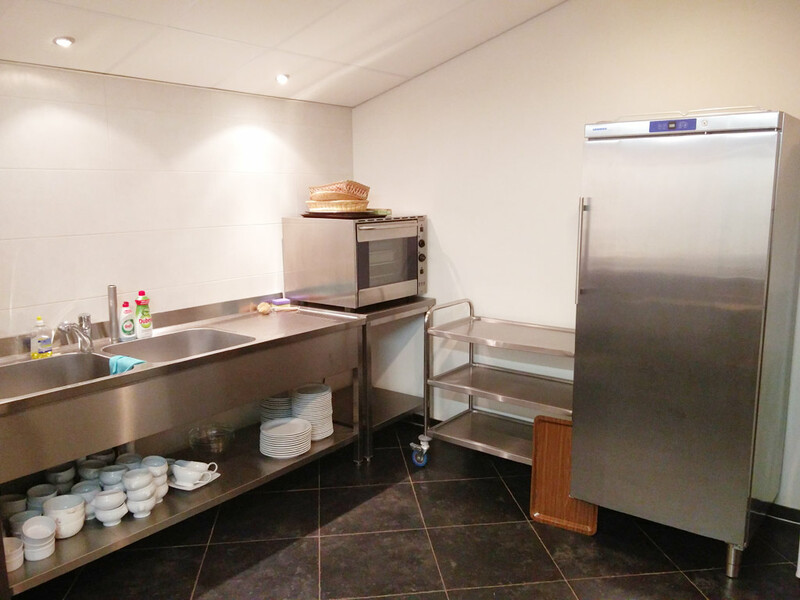 The spacious, modern and professional kitchen is fully equipped with a six burner stove, oven, microwave, dishwasher, large fridge and freezer. Through the hall you can reach the 15 cupboardbeds. 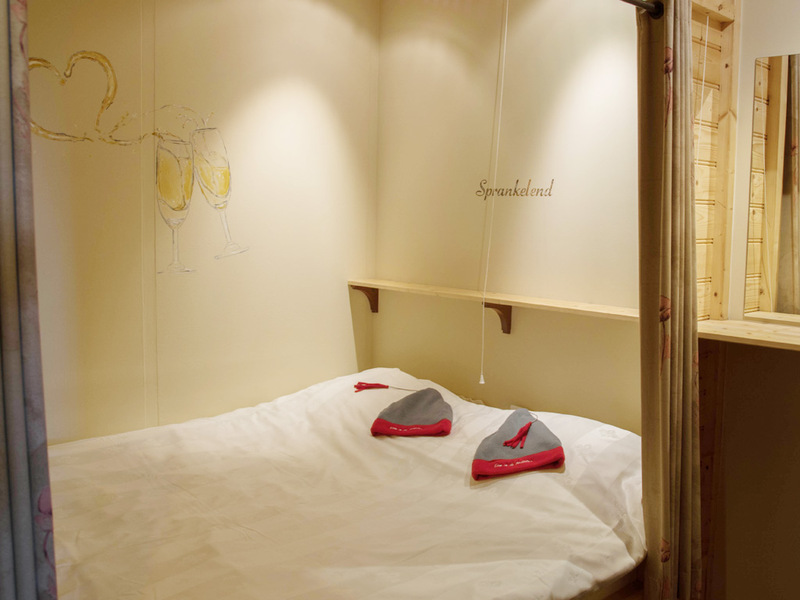 Each cupboardbed is suitable for 2 people. These cupboardbeds will be ready to use with your arrival. Due to the handiness needed to make the cupboardbed, the renting of linen is mandatory. Nightcaps are present for a good night’s rest. Choose your cupboardbed in advance! Through the hall you can reach the shower and lavatory room. 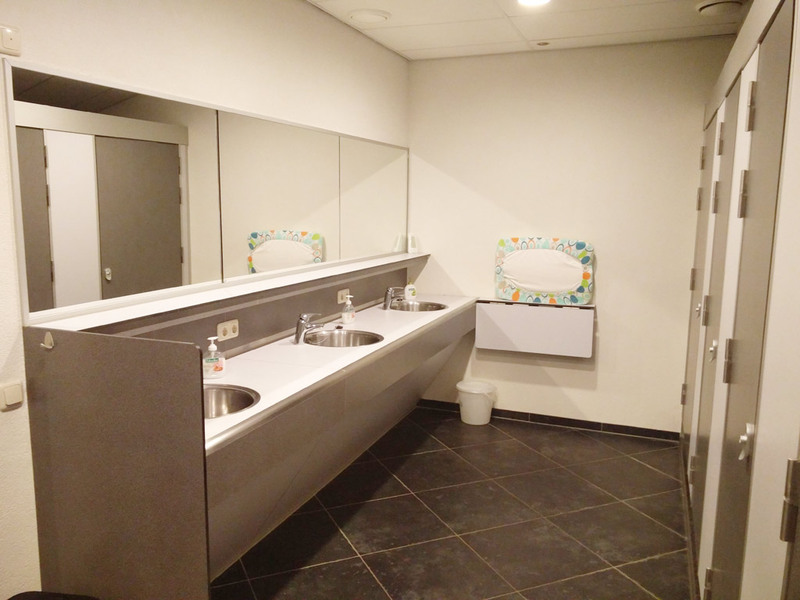 This room is equipped with 4 showers, 4 toilets and many sinks to make things run smoothly in the morning. For kids there is a special playground next to the living area. This fully heated and indoor playground with mural is 160 square yards, perfect to use on a rainy day. The playground has its own swing, climbing rack, table tennis, pool table, foosball and a large table for your kid to draw or do handicrafts. There’s also a mini-cinema for your kids to watch a movie. 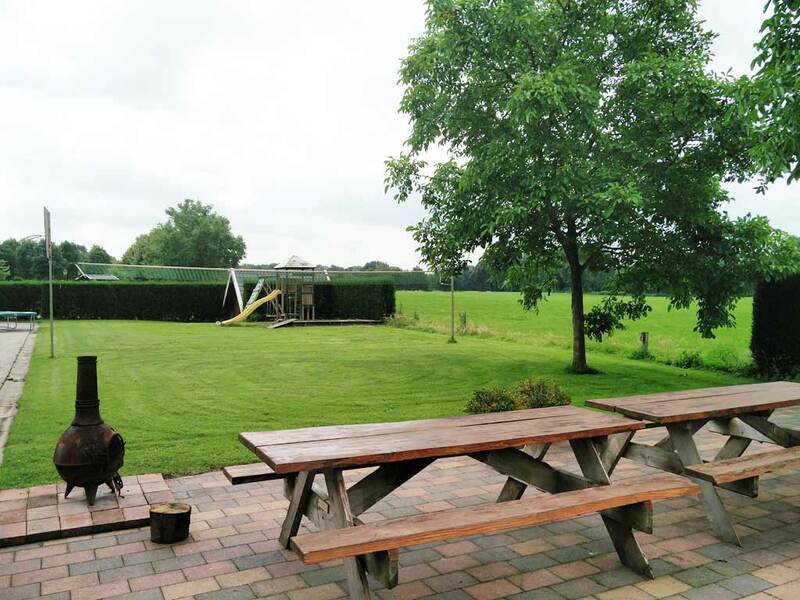 The countryside can be seen directly from the living area. You could take a lovely seat on the terrace, equipped with garden chairs and picnic tables. There’s also a wood fired hot tub for the real fan, a true recommendation! A spacious playground is present for the kids. Here you will find a swing, volleyball net and many more playsets for your kid to have a great time. On the terrace you could enjoy the peace and quietness of the countryside while keeping an eye on your children who are playing on the playground.